The narrative poem, which is often paid homage or parodied, depicts a man’s gradual slip into insanity, tortured by a raven who repeatedly answers “Nevermore” to the narrator’s insistent questions. The constant rhyming of the poem and the short, sharp pace of the text adds to the unsettling feeling it conjures. Throughout, the detailed description of the setting further builds a sense of uneasy suspense. Hugely influential, in poetry for the unique form of the work, and to the horror genre in general for its minimalist version of psychological torment, “The Raven” has also fostered a stereotypical image of Poe’s work which perhaps obscures the diversity of his output. Along with his other horror works such as “The Fall of the House of Usher” and “The Black Cat,” Poe wrote short mystery stories such as the “The Murders in the Rue Morgue,” or bizarre, fantastical tales such as “The Masque of the Red Death.” All of them deal with dark, but widely varied, themes. “The Masque of the Red Death” highlights just how diverse and complex Poe’s works are. It tells the story of a fictional country plagued by a disease known as the Red Death. Prospero, the prince of the country, locks the walls of his palace to keep out the plague, and continues to live a normal life despite the tragedy which is killing his people. Such is his lack of concern for the country’s plight that he even organizes a lavish masquerade ball inside the palace. At midnight, an ominous figure, dressed like a victim of the Red Death, joins the party. Shocked by the visitor’s ghoulish attire, Prospero confronts him and is immediately killed. Others in the party attempt to confront the strange apparition and all suffer a similar fate until the Red Death has killed everyone at the party. Although dabbling in themes of the supernatural, the short story is deeply allegorical. Prospero’s fate and the onset of the Red Death at the masquerade symbolize the inevitability of death and decay. Specifically, it shows the impossibility, even for the wealthy, of evading these inevitable fates. Prospero meanwhile, represents the vulgar excesses of wealth and power. His insensitivity to his countrymen’s plight sees him build walls with his wealth rather than use it to help them. Beyond mere cowardly self-preservation, his revelry at the party shows an unwillingness to compromise his own luxurious life, even if doing so could save others. Poe’s life was a tumultuous one from his youth until his death, one filled with controversy and mystery. This is reflected in the somber tone of many of his works. His parents, two prominent actors, were both dead by the time of Poe’s third birthday. Poe was fostered by his godparents, John and Frances Allan, who brought him up in Richmond, Virginia. John Allan, a wealthy tobacco merchant, afforded his foster son a good education, sending him to the finest boarding schools and eventually to the University of Virginia. That is, until a bitter dispute surrounding Allan’s refusal to pay Poe’s gambling debts ended in his foster son’s dismissal from the university. His life already showing signs of the turmoil which would come to define it, Poe joined the US army. While serving in the military, he published his first two poetry collections: Tamerlane and Other Poems in 1827, and Al Aaraaf, Tamerlane, and Minor Poems in 1829. Both collections were released into relative critical and public obscurity. Following his military service, Poe moved into the house of his aunt, Maria Clemm, and her daughter, Virginia, in Baltimore, Maryland. He became the editor of the Southern Literary Messenger in Richmond and embarked on one of the biggest controversies of his life when he married Virginia in 1836. She was just fourteen-years-old. Poe’s career as a writer gradually developed in the 1840s and he moved to New York with his wife. Shortly after his most successful work, “The Raven,” had been published, Virginia died in 1847. The tragedy pushed Poe into a self-destructive spiral of alcohol and drug abuse. In 1849, he got engaged once again, but died in mysterious circumstances October 7 of that year, just a few days before his planned wedding. 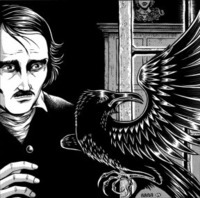 The Works of Edgar Allen Poe are perhaps befitting of the author’s controversial, sometimes tragic and often unhinged life. By taking a look at his poetry and short stories, it is possible to gain an insight into the bleak universe he created. Stretching beyond mere horror however, his works explore the diverse facets of the human condition. Source: Daryl Worthington, New Historian, January 18, 2016. I love some of his poems and stories, but not others. I don't really like the ones where he tries to be funny. People who lived at that time were often preoccupied with death because they were exposed to death from a young age. People today try to deny death. Some parents won't even let their kids see a dead pet, then when they get older and people they know start dying, they don't know how to deal with it.